Hello and welcome to the long awaited sequel of the Great Unrest! I truly hop it will be as enjoyable as the prequel! So before we start, I'd like to say a few things, merely of technical nature. So, those who participated in the Great Unrest, do not need to fill out the character sheet all over again, IF they wish to join with the same characters. In that case, it would be a nice gesture to all the newcomers to show a pic of your characters in your first posts. Thank you! Let The RP commence! Personality: She's very young, not even 20, but she has wisdom beyond her years. She's sharp minded, a born tactician, calm, collected, manipulative, persuasive but can be painfully honest as well, her loyalty and care to her kind is unquestionable and beyond every doubt. She's also quite tomboyish and sometimes waspy. Extra info: the purple stripes on her wings and body are used for bio luminescence. The intensity of the light is often linked to her emotions. 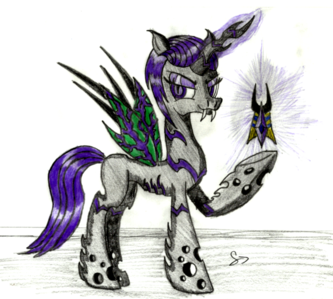 Since she's a very-very early and distant predecessor of Queen Chrysalis, she has a different appearance. Was it bad of me to join with out signing in? 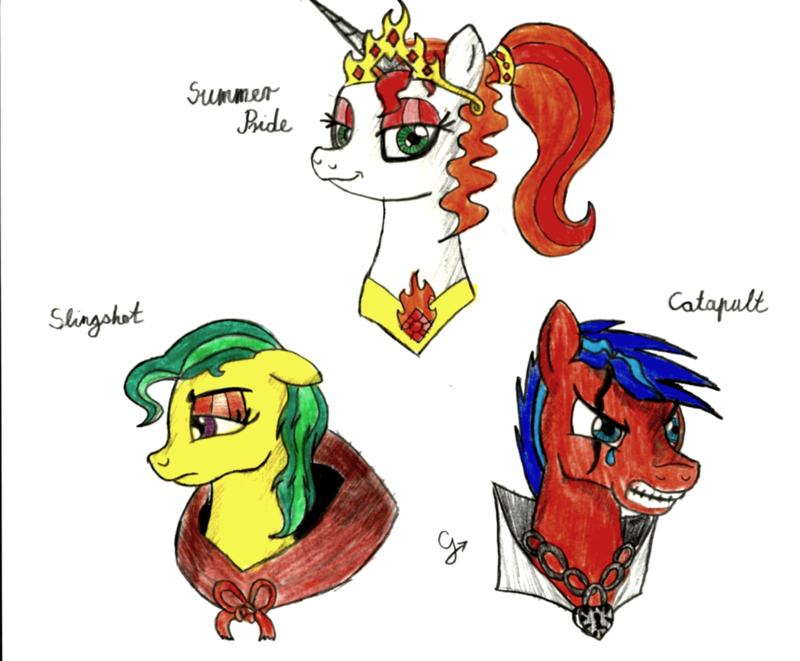 Equestria was now living in peace, with a fair system of feudalism. There was barely poverty in Equestria, if you walked through it's streets. Hardly anymore fights within the country. All these wonderful new arrangements, thanks to their Queen, Summer Pride. A decade had passed, and Wheat Roll was still the towns' well known doctor. With her having such an important role in the village, her fortune grew for her small family. Meadow, Longsword, and their newborn. Now, Meadow was already a fully developed sixteen year old mare. A shimmery yellow colored coat, along with orangish curly hair. Freckles in between her aquamarine eyes. Her personality of a filly never grew old. Always hyperactive and outgoing, willing to put a smile on anyone. Although, she was still a stubborn young mare. Meanwhile her little brother, Toy sword is a Courageous, childish, and caring little colt. Hearing the stories of his parents fighting in war, he's always dreamt of being a brave fighter, like them. Although Summer's rules with weapons, he'd pretend a stick was a sword. In the Village, a small, yet large home used as an infirmary owned by Wheat is set. The infirmary includes a dozen of beds, and shelves full of medicine. In the corner of the hospital, a chair and a slanted table is placed. Dozens of scrolls on the floor, written by a mare who was no longer a heretic hated by ponies. Her long brown hair tied into braid reached her hips. Beside her, a candle danced as she continued writing on paper with a feather. Her bright orange eyes focused on the scroll, writing carefully. Her back was covered with a dark blue cloak. Suddenly, a spark of magic appears in front of Wheat. The green coated mare lifts her eyes, but then shakes her head and continues writing. Abruptly, two hooves are placed around Wheat's mouth. Wheat gasps in surprise, accidentally shakes her hoof, dropping the ink and it spilling on the paper, ruining her work. She turns around, unexpectedly finding her daughter hugging her. Wheat: *breathes for air, still surprised* Meadow! Do not ever do that again! Meadow: Oh.. I'm sorry. I was practicing my teleportation spell! Wheat: *wipes her hooves in some cloth* Well, practice it outside. 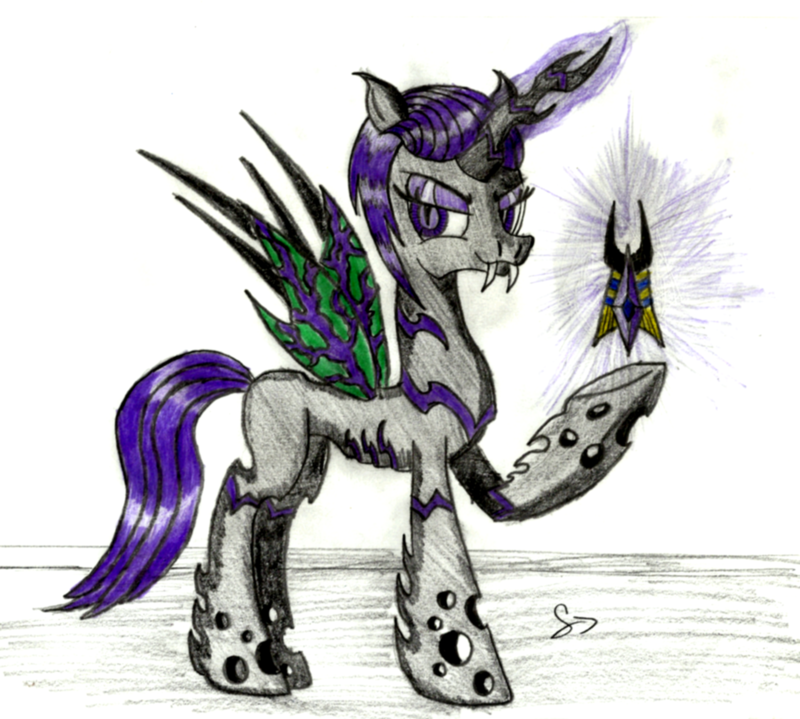 Meadow: *cleans up the mess she made with a flash of a horn* There we go! Wheat: Meadow! What have I told you of using magic inside walls? It's dangerous. You have not fully developed your powers, dear. Meadow: I just wanted to help.. Wheat: *furrows eyebrow, taking a good look at Meadow. Her frown quickly turns into a warm smile* I understand. Just be careful next time. Meadow: *nods* May I have permission to go to the market? Wheat: *nods head* Of course. Here. *pulls out a small bag of coins* Go, run along. Be back before dusk! Although, not all countries around the world were like Equestria. Meanwhile on the other side of the world, there was a poor, yet secretly rich isolated country called Iceland. 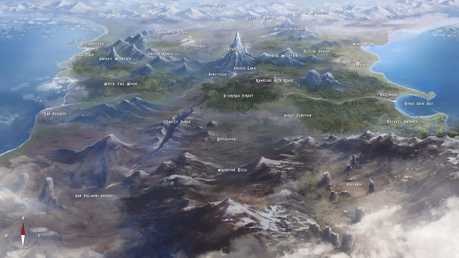 Nopony knew where this place was actually located, except the northmen. Once every while both would trade with each other, receiving treasures and animals. The Northmen and gypsies shared many things in common.. Religion, beliefs, habits, etc. The gypsies had marked their territory in the snowy mountains of Iceland. Tents and many small cabins were settled. The land was also full of animals, for they were sacred for the gypsies. Iceland was surrounded by the ocean, which made perfect defenses for invaders. There was no feudalism with the gypsies. Each did what they had to do. But, there was always a leader. In this case, the leader was a mother of two ponies. The brown coated mare finally climbed on the ship, after a tiring hour of filling barrels with ale and food. Her lifeless cold blue eyes focused on the water as she pulled the anchor out of the water. She wore a forest brown and greenish skirt, connected with a golden belt. Her belt was very detailed, holding two swords. The gypsy had a loose white blouse on, tighten by a black vest. She wore a cape of a lion's fur under her outfit. Her leather boots clacked on deck, as she organized the boxes and weapons. Her thick eyeliner formed the almond shape in her beautiful eyes. A long scar of a blade filled her cheek, but fortunately covered by powder. Tsura had shaved half her head, leaving the right side of her face covered by her wild black mane. On her hairless side, she'd tattooed a well known symbol of her culture, which reached her eyebrow. The pegasus flew her way to the wheel, where her brother Ragnar stood. Tsura's ears were pierced, feathers hanging of her victims as earrings. The left side of her neck was marked with a bunch of symbols as tattoos. As years had gone by, darkness had imprisoned Tsura's soul. She never seemed to smile anymore. Peace had never become a part of her. Nor her people. She was wanted as a prisoner everywhere. Posters of her and her brother around half the world. Ponies hated her, she hated them. She was a solitary loner. Doing the same thing year after year. The only thing she seemed to do well was kill, and steal. Her skills in fighting increased heavily, but her heart stood numb. Her brother had tried making her happy, as well as her mother, but nothing seemed to entertain her. Of course, she still had her mischievous side. Ragnar was dressed as usual. A black and golden long jacket, covering a loose white shirt. He wore black pants, as well as his boots. He had a sword within his belt. His hair, dark as night, was messy as usual. He continued wearing eyeliner under his eyelids. The only thing bright about him was his ocean blue eyes. Tsura's brother had a quirky personality. He was crazy, yet still was a gentlemen and a good friend. Also he was quite the trickster of the family. Being a gypsy, he was a storyteller. He could amaze anyone with his stories of the Gods and Goddesses. During traveling, he'd stop by a town and perform a show. A show where his sister sang and danced, while he told stories. The twins had prepared themselves in search of gold around the sea, or in any land they find. They'd be accompanied by the best fighters. They're plan was simply entering a village, act like mercenaries, and steal what they could. Tsura was an expert in this, as well as her brother. They'd split up during the day, collecting money, and meeting back at Ragnar's ship. Most importantly, they were going on that journey for a reason. The ninth year of Jeshavn was near. Every nine years, a celebration for the Gods occurred. It was where 9 sheep were sacrificed, including 9 panthers, and 9 pigs. Not only that, but they also sacrificed five stallions, and four mares. All gifts for the gods. Of course, the gypsies would include gold. And that was why it was time to take a journey for treasure. Tsura had extended the sail, and the ship was ready to leave. The twins had given one last kiss to their dear mother, Jaya. It has been a decade since the era of the Great Unrest ended. Summer Pride, the Queen of the Equestrian Empire woke up early in the morning as always, when the first rays of the sun reached out to the land. Summer was regal even in her sleep and even with a messed up mane. It was in her blood. Although he fashioned herself a golden tiara and a necklace her appearance remained modest but elegant, even with her love of jewelry. The only thing she did not like, that she couldn't let her mane down to flow freely, like before. But she had a reason to be proud. Equestria was flourishing, the economy was booming, no longer suffering under the yoke of internal conflicts. Summer was a cruel but just ruler. She made laws that protected the innocent, the weak and the helpless but struck down the wicked, the sinful and the criminals. She made the laws and enforced them with an iron hoof. That is why she groaned in frustration when she saw the lead article in the newspaper. "GYPSY WAYLAYERS COMMANDEER VESSEL OF THE ROYAL FLEET"
Her anger grew even more when she came across a familiar name as she kept reading the article: "These bandit hordes are believed to be led by Tsura Sly, ex Black Feather member and rebel. Although this mare played a significant part in defeating King Royalty ten years ago, she's killing innocent ponies now! Her good relations to the Queen is a well know fact, but how long will it save her from the dungeon she deserves? How long will the Queen sit idly by and let this maniac use our country like a playground?" Summer could not read on any longer. The newspaper in her hooves turned black and then burst into flames, only to become a small pile of ash in a second. "That pesky news reporter is right!" Summer said to herself with a strong voice. "I've been patient with her for far too long! I looked the other way on her activity, because it was beyond our borders... but Tsura's gone too far this time! Stealing my ships?! It is time to put an end to this nonsense!!!" This day brought nothing new to the yellow coated pegasus mare. Every day was the same in the monastery. Only a few ponies knew about the monks of the Smokey Mountain. Most ponies stayed away from this place, because it was very near to the Frozen North. She lived a humble, modest life. Lots of work and praying. But she was used to that. She found the service of the Creator cleansing. Slingshot combed her vivid green mane away from her face and paused for a moment. She was harvesting with the other monks. They knew everything about her past, yet they accepted her. The former leader of the disbanded Black Feather Squad, King Royalty's most fearful warriors... She made peace with herself. She looked around once more real quickly. Everypony around her was working tirelessly in the heat of the Sun. The thought that she's one of the monks reassured and pleased her. Nopony knows her whereabouts. She let out a sorrowful little sigh... Nopony... except for one. He awakened with a splitting head like most days... The Sun was already high on the sky, almost reaching its zenith. He wanted to get up but his arm was numb. Then he realized it wasn't numb... a mare was lying next to him in the bed... right on his arm. He had no recollection of last night. He didn't even remember bringing this mare home... He eventually managed to get up. "All right! I'm gonna be late from... uh... work. Make yourself a coffee and get out of here!" Catapult said, rubbing his forehead. "Damn... what did I drink last night?" He stepped out of the door, right into the sunlight. He narrowed his eyes, cos it was blinding him. Catapult slowly walked down the street right into a bar. It looked like a typical Manehatten facility, every street had bars like this one. The bartender immediately came over to greet him on a friendly tone. "The usual?" the bearded, old stallion asked. "I wanted to tell you... last night's fight was amazing!" the bartender exclaimed with enthusiasm in his rattling voice. "You nearly decapitated that guy! Where did you learn such moves?" A giant smirk expanded on Catapult's face before he replied: "In the Church." The voyage was short, only three days at sea. The gypsies had arrived on land, all perfectly safe. Most of the ponies accompanying Tsura and Ragnar were Pegasi, all well taught in flying. As usual, the bandits had split up in search for treasure, quietly scaring the ponies from the village as they entered the rich homes. As for Tsura and Ragnar, they had other plans. Knowledge from other lands they've stolen from, they learned a church was the best hideout for treasure. Although, they had no idea what the hell was even a church, nor the Christians' beliefs. They'd steal golden crosses, not knowing what they were. On the arrival day, Tsura and Ragnar immediately headed to the church. But little did one gypsy know, she'd be meeting an old friend. The church seemed to be empty. Not a single soul was in there. Tsura and Ragnar quickly scouted the area and agreed that it will be a perfect hideout. Then they decided to have a drink at one of the local bars. 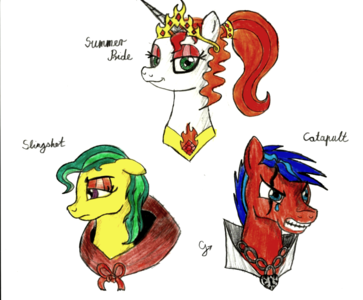 They were anticipating their next heist, for Manehatten was known to be a rich city. They set down to the bar, taking a few shots. They didn't notice the hours passing by and it was already dusk before they knew it. And the place was starting to get packed with all kinds of low life ponies. The gypsies decided to stay for a little more to catch up on some rumors and possibly rob somepony when they leave. But a nearby, quiet conversation grabbed Tsura's attention. Earth pony: Did you hear about this guy? Unicorn: Yeah, that's why I'm here! He's got a pretty big reputation! Earth pony: You're not kidding! I heard he even ripped somepony's heart out in the ring. Unicorn: Haha, I heard he's the best around these parts... I'll bet a small fortune on him! Earth pony: Well, we're gonna see some bloody fight tonight, that's for sure! Unicorn: When will it start again? Earth pony: After closing you numbskull! When else? Or do you want to disappear in the Queen's dungeons?! Earth pony: Right! You can do that over there at the bartender! Earth pony: Trust me! He's good! Some ponies say he's an ex Black Feather! Tsura: *perks her ears as she hears the conversation, but remains quiet. * *she speaks to her brother in Romani* Ragnar, I believe there's a new treasure here. 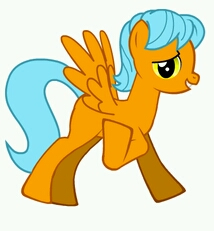 Ragnar: *laughs and bends his neck, stretching* Tell me, who is this pony? Tsura: *drinks another sip of rum from the counter* I don't know. These dolts are saying he's a fighter of the Black Feather Squad. Perhaps I could defeat him. Ragnar: *plays with the wooden cup, twirling it* Yeah, not going to happen. I'll right him. Tsura: *pulls out a sheet of paper, explaining the fights* It says no injured fighting. *looks at Ragnar* You have a hook. Ragnar: Which I can poke his eye out. Tsura: *folds paper* Yeah, I don't think so. Switch clothes with me. Ragnar: I am not wearing a skirt. Tsura: Fine, just stay naked like the rest and give me your jacket and pants! Bartender: *all right ladies and gentlecolts, last round! We're closing in ten! if you wanna place a bet, don't hesitate! *turns away and whispers to his assistant* Go and tell the guy he's gonna be on in 15, will you? After a few moments, Tsura had fully dressed up as a stallion. She wore the leather jacket, tightening it up. The pants were loose, but she had a belt. She had erased her eyeliner and lipstick for the fight. Her half mane, was done into a braid, then hidden by a liripipe. The bartender waits for a few more minutes until the common guests finish their drinks and leave, then closes the bar. The regulars are already going down to the basement. The place is illuminated by a lot of torches and there's a giant cage in the middle of the room. The air is stuffy, filled with the bitter mixture of sweat, cigars and alcohol. It's quite crowded down there as the bartender shuffles through the living mass to reach a small podium. Bartender: Mares and gentlecolts! Without any delay, presenting our first fight of the day! On the red corner, our undefeated champion! The minister of agony, the barron of brutality, the coroner of carnage, the dealer of destruction!!! Black Feather!!! A stallion wearing a hood steps into the cage, his face remains hidden. He slowly walks to the middle and idles silently. Bartender: As always we have several opponents waiting, but if anypony feels touch enough to beat our champion will win all bets! Are there any volunteers? You there! Feeling lucky, son? You'll get 200 bits if you survive a round with the Black Feather! Come on! Nopony's brave enough? Sounds like a good time for me to get in. Personality: Slightly cocky, won't back down from a fight, but caring just the same. Power Play, one of the patrons in the bar's basement: I'll accept the challenge. BRING ON THE BLACK FEATHER! Bartender: Excellent! Our first challenger of the day! Bartender: you all know the rules: no victory is too small, no wound is too great, no method is illegal! Good luck, son! *rings the bell* First round! Power Play, matching BF hoof-for-hoof: I bet you're only doing this becuse your mother never loved you! Wouldn't surprise me, the way you've been fighting! BF: *flares wings to consume the energy of the hit and lands on his hooves, revealing two sharp daggers that were concealed on a belt under his wings* you are starting to get on my nerves, boy!!! Tsura carefully observed the two ponies fighting, her face hidden. She watched every move for when her time came, she would know how to defend herself. A wide grin expanded in her face. She looked at the host and talked in a deep accent. "I'd like to go next, after one of these dweebs loses." Power Play: *conjures up 2 daggers of his own* Same here! Bartender: *nods to Tsura in acknowledgement and watches the fight until the time is up* It's over! What do you know? The little guy survived a round! 200 bits goes to... uh... what's your name, son? Power Play, breathing heavily and slightly bloodied: My name... is Power Play. Give me my bits. I earned them. Bartender: You most certainly did! *pays the money* Have a drink over there at the bar! On the house! and we'll have some pretty good fights scheduled for tonight, so if you're interested, sit down! You won't regret it! *turns around* all right, next opponent, in the cage! Personality: Patient, Kind and down-to-earth but sometimes he focuses on something too hard that he doesn't notice what's happening around him for a moment and is usually so silent that its like he's not there until you notice. Bio: (it's not really that crafted yet...?) Born in a family of Astrologers, he too grew up with the belief, Astronomy. With that, he didn't really get to spend that much time socializing as he was busy with stargazing and since he's usually in a trance when doing that, he doesn't really pay attention to them much...he often moves to different places, looking for different spots to see the stars and sometimes because of some sign that they showed to him. Tsura: *walks to the center, facing Black Feather. She grins, as her face is hidden* Good luck, you'll need it. Tsura with a rapid move ducks, avoiding BF's attack, and instead, she grabs him by the wings and throws him against the cage, holding him down. As she's holding him down, the grimace of untold rage suddenly and unexpectedly disappears from his face to make way for utter shock, surprise and confusion as their muzzles only a few inches away from each other.